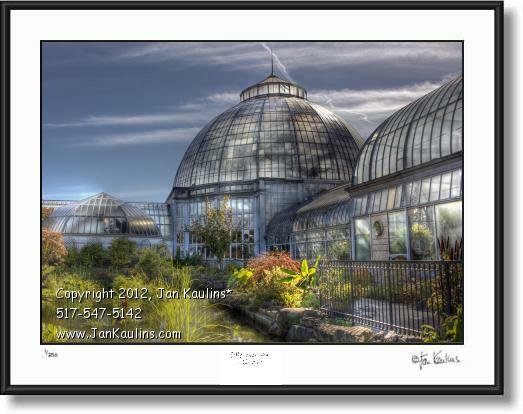 BELLE ISLE CONSERVATORY photo picture art print photography for sale. This Detroit BELLE ISLE CONSERVATORY photograph picture print for sale is made from nine bracketed photographic exposures and tone mapped which give it it's artistic appearance and wonderful colors. "The Anna Scripps Whitcomb Conservatory (commonly and locally known as the Belle Isle Conservatory) is a greenhouse and a botanical garden located on Belle Isle, a 982-acre island park nestled in the Detroit River between Detroit and the Canada–United States border. The park itself consists of 13 acres of preserved land for the conservatory and its botanical garden. The conservatory, along with the neighboring Belle Isle Aquarium, was designed by renowned architect Albert Kahn and built in 1904, and was remodeled and renovated several times years after. In 1953 the structure was named in honor of Anna Scripps Whitcomb, who left her grand collection of 600 orchids to Detroit, and made several generous donations afterwards. The building of the Belle Isle Conservatory itself possesses a strikingly impressive domed center reaching 85 feet in height, which houses the exotic palm trees and plant life from South America to the jungles of Southeast Asia. " On the East side of the Conservatory is a beautifully landscaped pond (filled with Koi and Goldfish during warmer months).